Wow, what a weekend to host the Miracle End of Season Championships! 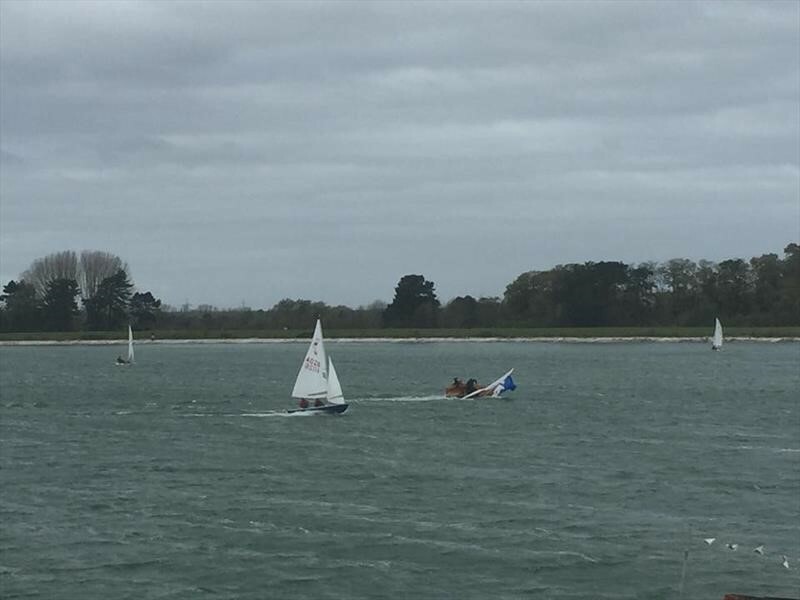 Storm Brian definitely provided the spectators with some thrilling entertainment on the water! After the news spread that many other open events had been cancelled due to the imminent arrival of Storm Brian, there was some doubt on whether there would be any sailing for the fleet on Saturday afternoon. However as race time approached the decision was made to go ahead with the racing, whether this was a wise or foolish decision is still up for debate! Although the underlying wind looked manageable, the direction of the wind meant that it was coming over the club house, hitting the water, and squalling in all directions! This made for extremely testing and unpredictable conditions. Out of the 8 boats 5 lined up on the slipway ready to launch. After a particularly vicious squall came through, nearly launching the boats off their trolleys, Dave and Zara made the call to take their sails down again and keep their kit dry for the day! Wayne and Angela, Simon and Mark, James and Paul, and Graham and Helen were less easily put off and headed out anyway! Saturday evening was spent in the pub across the road which provided some delicious food with excellent company. The lighter weight crews used this as a great excuse to pack as much extra weight on as possible before Sunday! Sunday dawned with hopes of decreasing winds; however the wind remained very strong, although the change to a westerly direction meant it was much steadier. 7 boats ventured out this time. Wayne and Angela led round the windward mark, closely followed by Dave and Zara, and Simon and Mark. Dave and Zara took the lead on the spinnaker reach, overtaking Wayne and Angela to leeward, but were unable to hold onto the lead on the next beat, falling back to third. Simon and Mark unfortunately went in on the gybe mark next lap, allowing Dave and Zara, and Dave and Ross to pass. Wayne and Angela built up a good lead to finish first, ahead of Dave and Zara, who held off a good challenge from Dave and Ross. The decision was made to head in and have an early lunch, hoping that the wind might reduce enough for two races to be held later. This was wishful thinking! Only 4 boats ventured out for the next race. Wayne and Angela led again, followed closely by Dave and Zara, who can’t have eaten enough the night before to put sufficient weight on for those conditions! James and Paul and Simon and Mark had a great tussle all race, with Simon and Mark just taking James and Paul on the last leg. After securing their overall victory Wayne and Angela headed in, and after yet another vicious squall came through the others followed when the call was made to abandon the last race… Phew! 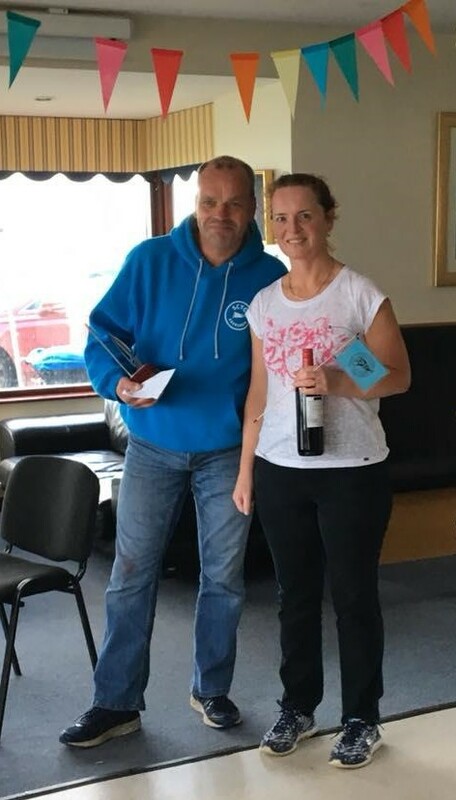 With only three races held there were no discards which meant Wayne and Angela took the top spot, followed by Simon and Mark in second, and Dave and Zara in third. 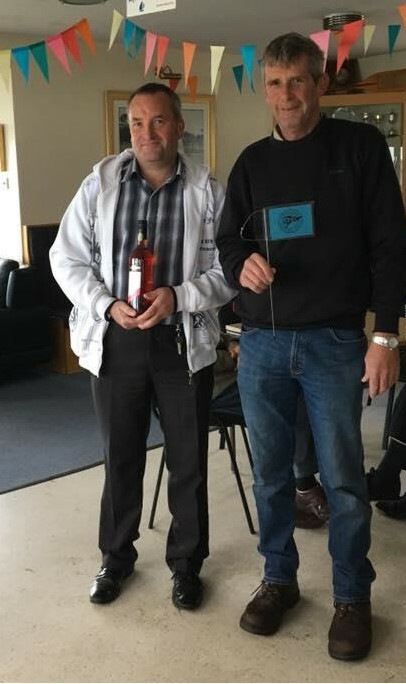 A big thank you to Shustoke Sailing Club for hosting the event, the race officers did a great job in those conditions, plenty of rescue cover was provided to assist with the (surprisingly few!) capsizes, and the galley team provided some much needed sustenance! The Miracles have had 10 open events this year with 13 different boats inside the top three! This just goes to show the high standard across fleet, which makes for some great racing! Tracy Amos and crews Gemma Gibson and Hannah Mumford who had a first, second and two thirds. Dave and Zara Turtle had a first, two seconds and two thirds. Dave Butler and Ross Fleming had two firsts (including a nationals win! ), a second and third. Wayne Atherton and Angela Sweeney had three firsts, a second and third. It’s been a great season thanks to the efforts of everyone travelling to the various events. Roll on next year!